Published on December 5, 2015 by Martyn. Be the first to comment! As a spin-off from my involvement as a judge for the children’s category of this year’s Costa Book Awards, the nice people at Costa asked me to write about my favourite festive read. The piece has been published as part of a Christmas promotion in their latest newsletter, which is distributed to two million members of the Costa Coffee Club loyalty-card scheme. So I thought I’d share it with the, er, somewhat fewer subscribers to my blog. As you’ll see, below, my favourite festive read isn’t very festive at all. My Christmas read is an homage to summer. Let me explain. As a boy, once I’d outgrown Blyton and the Beano, I read little else but science fiction – specifically, John Wyndham and Ray Bradbury. 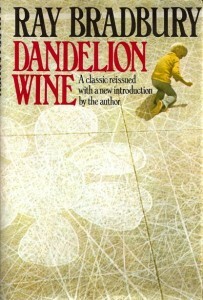 So, one Christmas, I was delighted to find Bradbury’s Dandelion Wine among my presents. I was about twelve – the same age as Douglas Spaulding, the novel’s hero. I say ‘novel’ but, strictly speaking, it’s a sequence of semi-autobiographical stories which fictionalise summertime episodes from Bradbury’s childhood in small-town Illinois. I recall none of these details, by the way; I’ve had to Google them. What does linger is the atmosphere – a surreal, magical quality conjured by the stories’ blurring of realism and fantasy. And an evocation of place so vivid the images smudge the recesses of my memory like chalk on a badly wiped board. Even now, forty-odd years later, I can’t retrieve a gift from under the tree on Christmas morning, or open whichever new book I’ve been given, without catching a summery whiff of Dandelion Wine.